Thermometers are temperature measuring devices used to measure temperature of Beers, Soda, Coffee Tea, Water, Meat, Air, Body Temp and much more.Assuming your thermometer is calibrated, temperature can be represented in any measurement system; many high-end thermometers offer automated conversions to multiple systems, as well. There are a wide variety of thermometer designs, from analog, electric and heat-sensitive strips, which are used for everything from beer fermentation to medical and domestic use as well as industrial control. 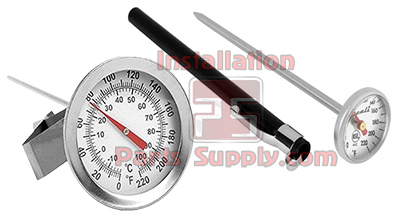 Analog and electronic thermometers are the most common in use these days. Electronic thermometers work through a relatively simple process: the input temperature changes the amount of electrical resistance within the device. A small microprocessor within the thermometer calibrates the change in resistance, and translates it into a temperature reading. 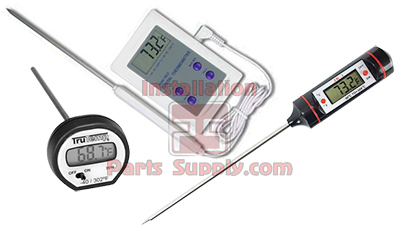 Other thermometer designs include bimetal thermometers such as our "BrewMometer" or thermometer for Home Brew. 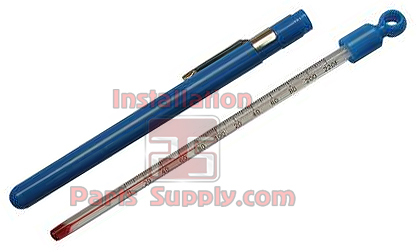 Bimetal thermometers consist of a coil, attached to an encased pointer, which expands relative to the temperature. As the temperature increases, the coil expands, pushing the pointer further; as it cools, the coil contracts.